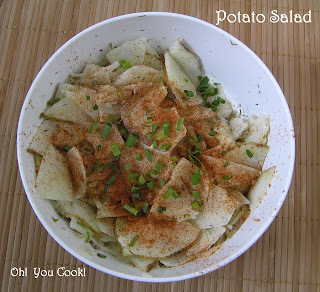 Potato Salad Redux, plus a Giveaway! I want to start this post with an apology to OXO. Almost immediately after receiving their generous offer in the mail (see below), the book offer dropped into my lap. Work on book? Or post about mandoline? No contest ... sorry, OXO! Full disclosure: The #OXO company, as part of their Blogger Outreach Program, provided two mandoline-style slicers for free, one to use and review and another as a free giveaway. I was not paid for this review. Unless you count the freebies. We now return you to our regularly snarky scheduled post. I already own a couple of crappy inexpensive mandolines, so I was really thrilled that OXO was willing to provide a new improved version for my very own, plus another to give to a Dear Reader! Read below to find out how to score your own. My old slicers only have two thickness steps, paper-thin and see-thru. The OXO has 3 thickness steps. So not even out of the package it was far and away superior.